LOST deep in the woods is a small hamlet, its buildings crumbling before your eyes, evidence of the drift of people from the Périgord countryside in the past. 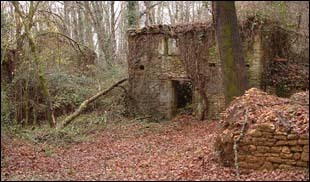 In the woods around Villefranche du Périgord there are many small buildings that have fallen into disrepair. But the chance to see a hamlet with a large barn, the remains of a bread oven and clearly recognisable architecture was a chance not to be missed. The wall of the barn was at least 20 feet high, with a small pond to the rear, and you could see the recesses for the timbers that would have supported a floor and the roof. Next to this was a small house with a bread oven covered in brambles, possibly there to provide bread for the larger house. There were two small outbuildings with stone lintels, the outline of a pigeon coup and leading up to the hamlet a narrow track, with a stonewall down either side. As for its age it was difficult to tell, there was nothing on the ground, no pottery or tools, it was clear that nature was doing its best to erase time. To see a collection of photographs please click here.